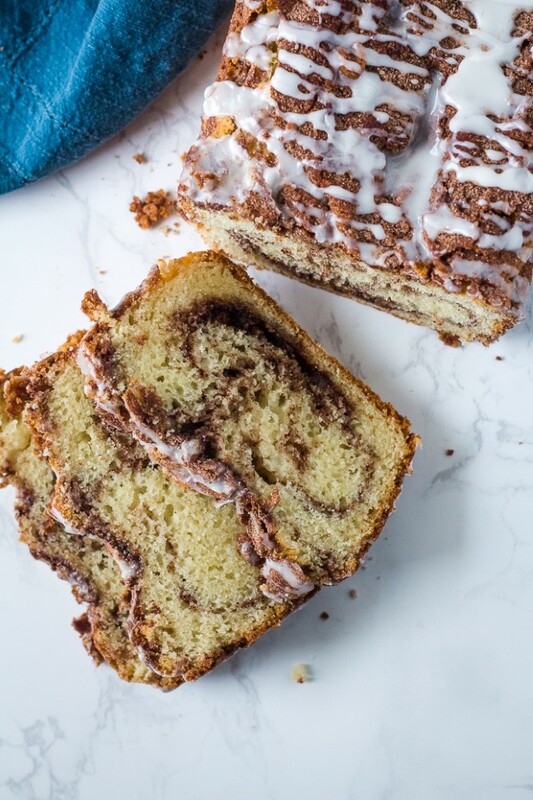 The recipe on my blog for the best cinnamon rolls ever is one of the most popular and gets amazing reviews. However, it’s time intensive and not all of us want to wait 5 hours for warm cinnamon rolls. 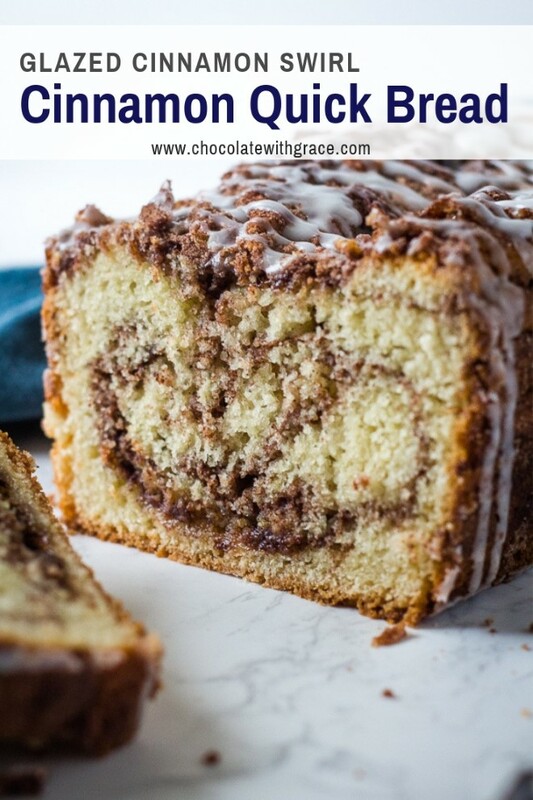 Here is a cinnamon roll quick bread that is way quicker than traditional cinnamon rolls. I took this to a brunch and it disappeared so quick, even before the banana bread. I love this recipe because all the ingredients are pantry staples. It’s perfect when you need a treat and don’t have time to run to the store. Start by stirring up a simple batter. Whisk the dry ingredients together, then the wet and mix barely until combined. It’s better to have a few bits of flour that aren’t stirred in, than to over mix it. Over mixing will lead to tough dry bread. Add half the batter to a greased bread pan and then sprinkle half the cinnamon sugar mixture over the top, then add the rest of the batter and top with the rest of the cinnamon sugar. Gently swirl with a knife a few times. Bake for 45-50 minutes. 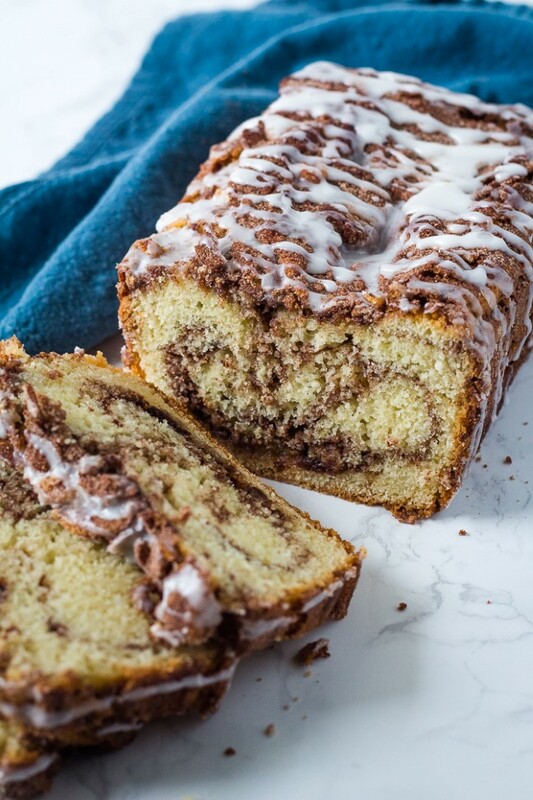 After the bread is cooled, make a simple glaze of powdered sugar, milk and vanilla to drizzle over the top. Like all quick breads, this one is moister and more flavorful the 2nd day. Store it tightly wrapped. We like to eat this bread for breakfast on special occasions or it makes a nice afternoon snack 🙂 It’s almost like cake that you can hold in your hands. Let me know if you make this recipe and what you think. Tag me #chocolatewithgrace on Instagram and be sure to follow me there. Preheat oven to 350° F. Grease a glass 9 x 5 inch loaf pan. Whisk together the flour, sugar, baking powder and salt in a large bowl. Combine the milk, eggs and oil. Stir into the dry ingredients just until combined. Don't over stir. To make the cinnamon sugar, whisk the cinnamon and sugar together in a small bowl. Pour half the batter into the loaf pan. Sprinkle with half the cinnamon sugar mixture. Top with the other half of the batter and then the remainder of the cinnamon sugar mixture. Gently swirl with a butter knife several times to make the swirl. Bake in a preheated oven for 45-50 minutes or until a toothpick inserted comes out clean. Cool 10 minutes in the pan and then remove from the pan to cool on a wire rack. To make the glaze, mix the powdered sugar with the vanilla and enough milk to make a smooth glaze. Drizzle over the cooled bread. 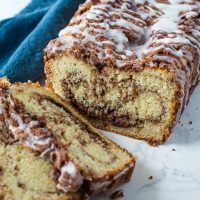 If your a cinnamon roll fan, here are three more ways to enjoy them without making an actual cinnamon roll.